﻿ LoL free skins list: Simple Guide to Unlock Skins Now! LoL free skins step by step guide. Riot Girl Tristana, Unchained Alistar, Dreadknight Garen, Medieval Twitch and Grey Warwick. There are several skins in LoL which can be received for free together with the free champions (! ), but you have to perform certain actions to get them (e.g. become a Twitter follower or bring a specific amount of friends via refer-a-friend program). In this guide, we will explain how to get free LoL skins. 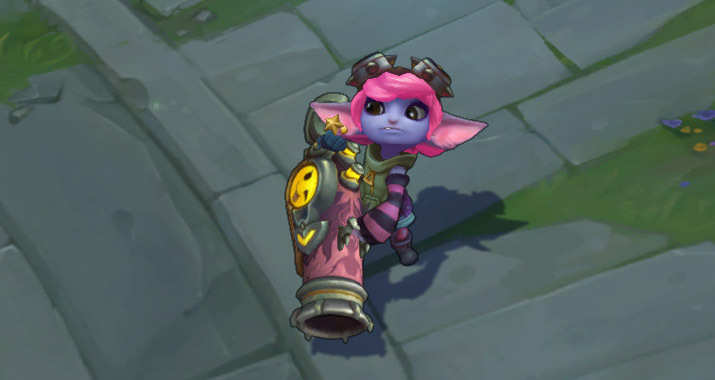 The first free skin available is Riot Girl Tristana. It’s a nice looking skin which got it’s rework during marksman update, happened in league in 2015. All you need to get that skin is to like LoL official Facebook page. More details below. 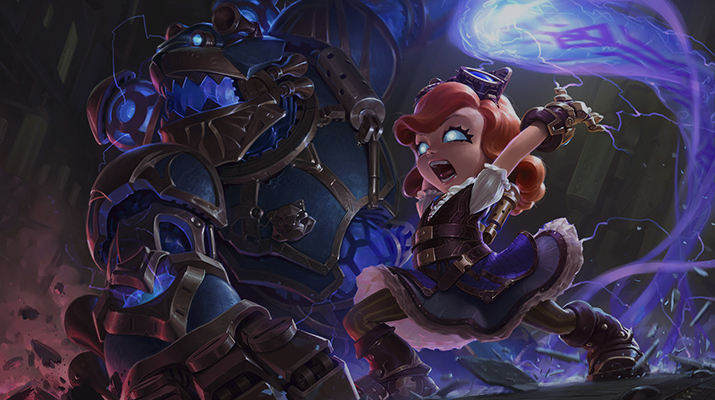 To get free Riot Girl Tristana skin and free Tristana champion (if you still didn’t unlock her yet) you have to “Like” official Riot Games page in Facebook via coupon app. A great and easy way to get free LoL skin which provides a free champion as well. 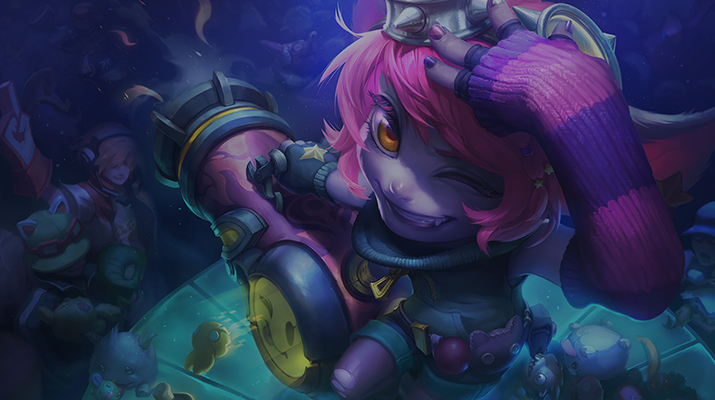 Splash Art for Riot Girl Tristana is really amazing! Garen is champion with one of the most simple mechanics in LoL. Thus not surprising that you can get that champion for free with free dreadknight skin included! 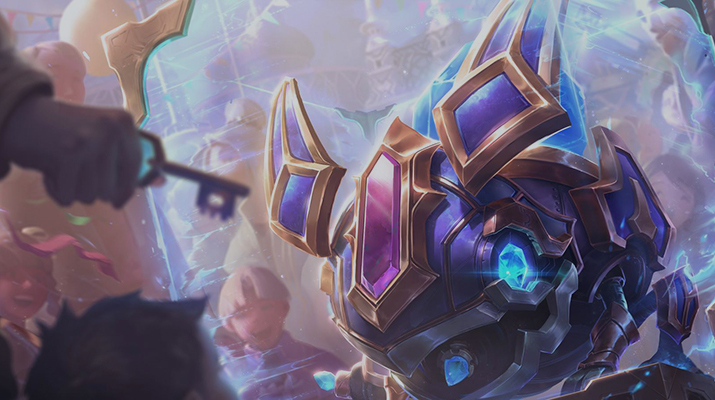 To get free Dreadknight Garen skin and free Garen champion (if you still didn’t unlock him yet) you have to become a follower of LoL Twitter account. 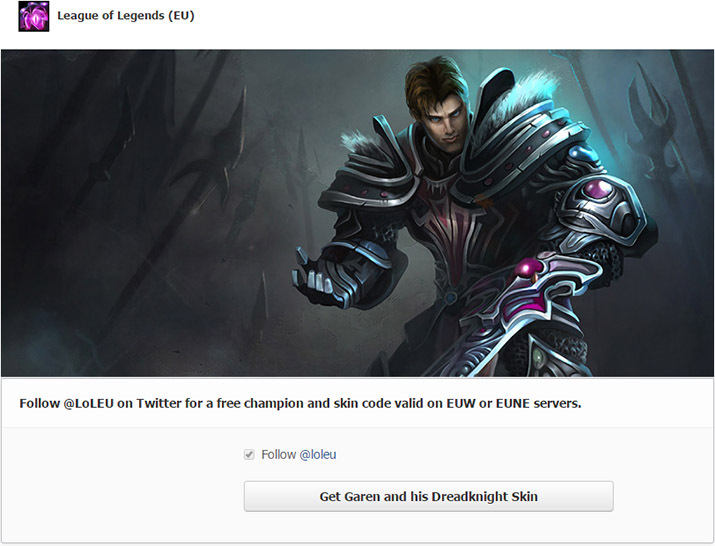 Choose link with your server and then click “Get Garen and his Dreadknight skin“. 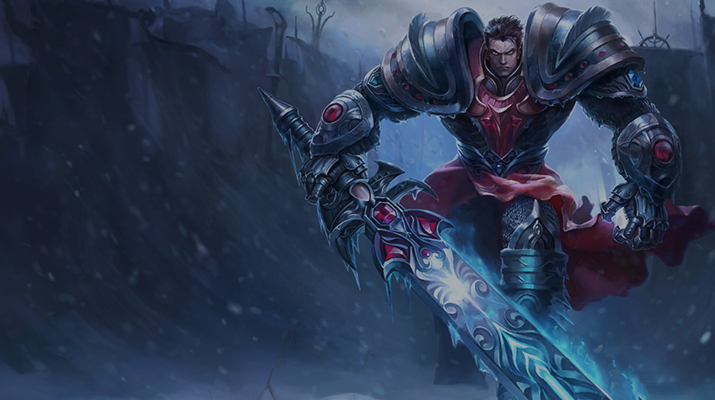 Details how to get this Garen skin are below. Subscribe to Twitter account or follow the instructions on the pages above. 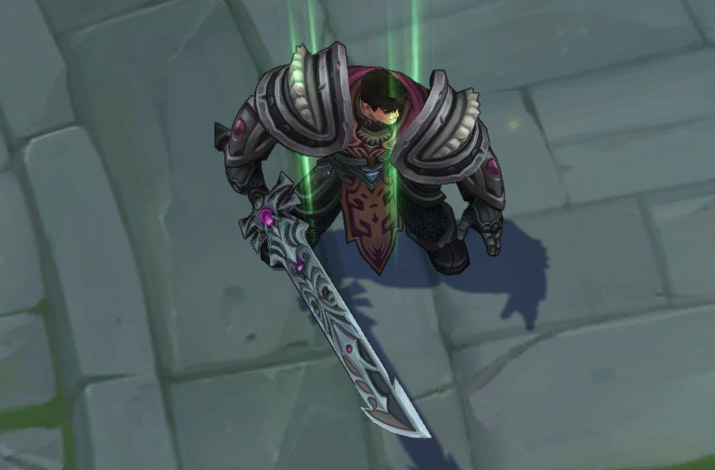 This free skin doesn’t have unique visual effects but it still looks great and provides you with ability to play LoL with “Dark Garen”. 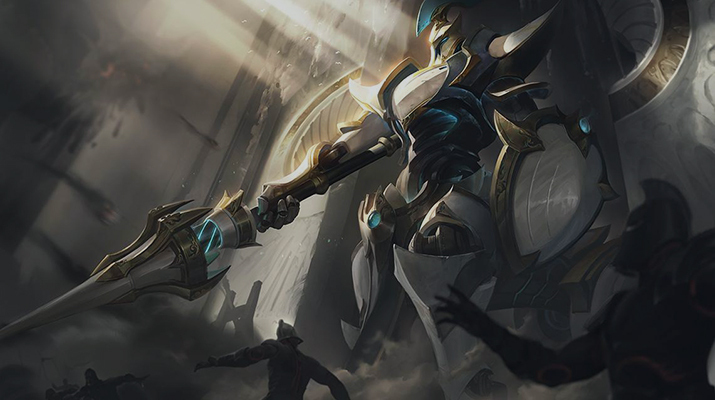 Splash Art is also decent. Alistar is fun and aggressive support champion and you can get a free skin for Alistar with champion in addition! Read details below to learn how to get him. To get free Unchained Alistar skin with free Alistar champion (if you still didn’t unlock him yet) you have to subscribe to LoL YouTube account. The previous method is not working anymore thus you will have to input some efforts to get Alistar skin for free. The good news it’s still easy. Choose “I’m having techical issues”. Copy and paste this text to the description field: “Attempting to use the link to redeem the unchained Alistar only brings up a blank page. I have subscribed to the YouTube channel. But am unable to discover how to get skin through normal means. Please see the attached screenshot where I am signed in and subscribed to RiotGamesInc YouTube channel. And the second page where the http://youtube.na.leagueoflegends.com/en/youtube brings up a blank page. If unchained Alistar is no longer available I understand, and this ticket can be disregarded after I am notified of such. Otherwise can someone please direct me on how to resolve this issue? You should receive an automated response with free Unchained Alistar skin within minutes. This LoL free skin was re-worked recently, and now it is looking even more awesome! New animations, upgraded graphic and the conditions for obtaining Grey Warwick are quite simple – you need to have at least 3 friends who have reached level 10 on your Refer-a-Friend program. Invite 3 players to LoL via refer-a-friend program or create 3 accounts by yourself. 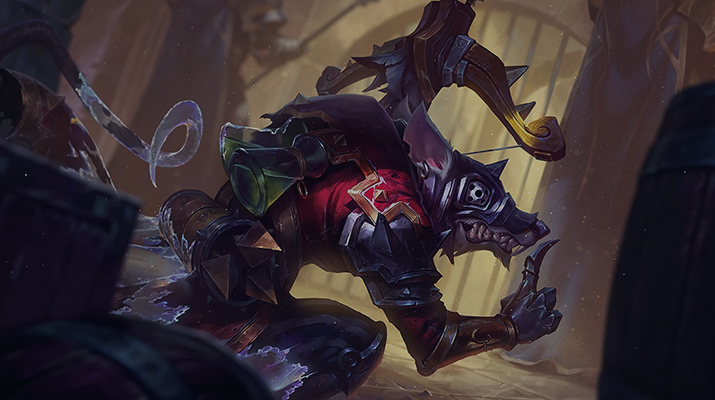 Once all three accounts reach level 10 you will get this warwick skin for free. That moment when you think: “Glad I created a hell lot of accounts back then to get this skin”. And it definitely worth all time that I spent. You will have to use the same method to get Medieval Twitch skin as with Grey Warwick skin with only difference that this time you will have to bring 5 players to LoL. Invite 5 players to LoL via refer-a-friend program or create 3 accounts by yourself. 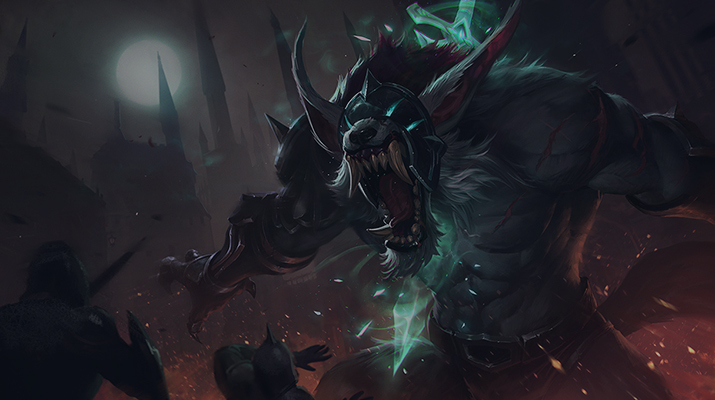 Riot Games re-worked this skin, new visual animations, skills animations, and graphic design and you can get this free League skin via Refer-a-Friend program. Just invite all your friends who like Moba-kind games. Triumphant Ryze is really hard to get for free since you have to win any official LoL tournament. At least it’s not necessary to be a major event. 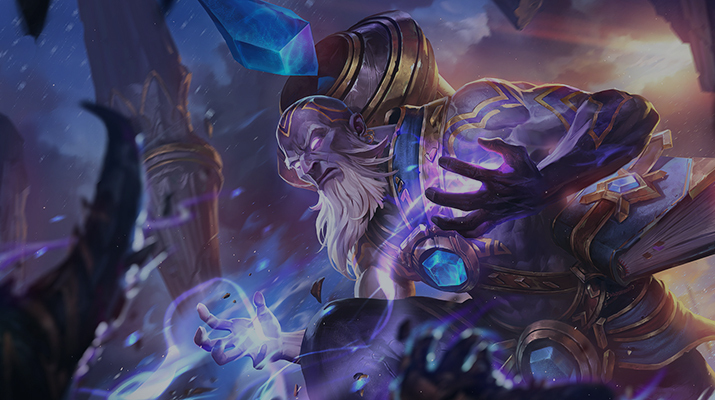 This makes Triumphant Ryze skin very special and attractive since it’s almost impossible to get for usual LoL player. Profit! You got Triumphant Ryze, congratulations! Most of the LoL skins you can craft via hextech crafting system and get them for free. But there are some really hard to get hextech crafting skins which you can craft for 10 gemstones. One of the best Annie skins and is totally worth to craft. Skin looks very nice and has unique visual and sound effects. Worth to craft if you tend to main Kog’Maw. 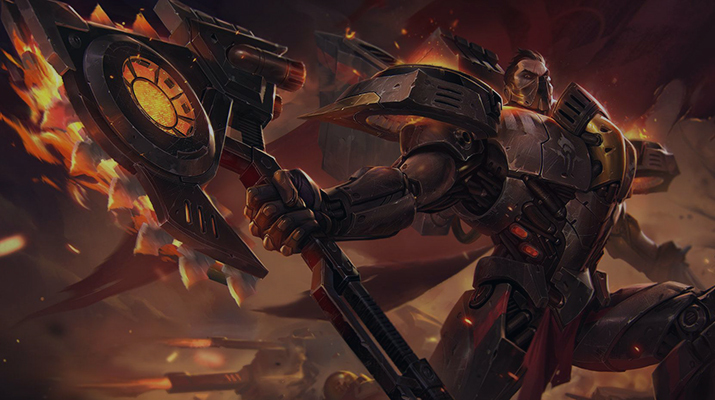 Probably the best Darius skin. Very brutal and charismatic skin, especially if you like cosmic operas. Totally worth to spend 10 gemstones on it. 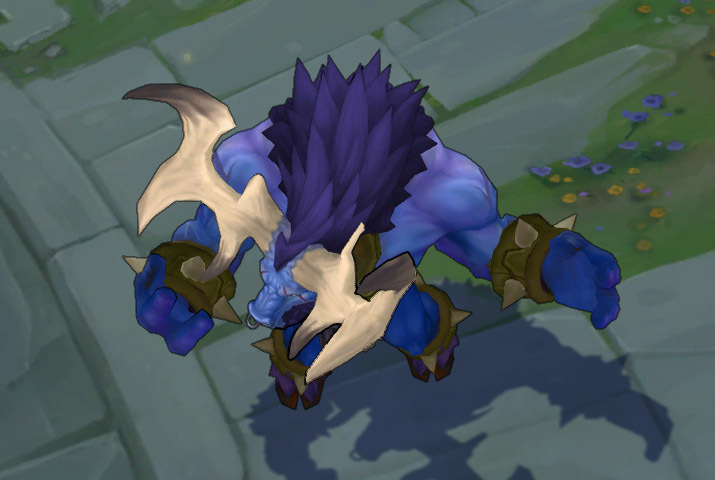 Very likely that it’s the best Alistar skin available now. Unique visual and sound effects included. Looks impressive. Decent looking skin with nice splash art but probably not worth spending 10 gemstones unless Vayne is your main. The model of this skin meh but visual effects are great. Still good for a “free” skin. That’s all skins available via crafting system. 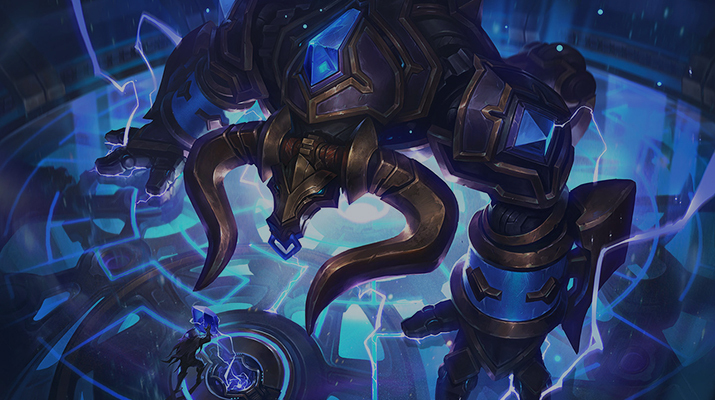 You can read a full guide about Hextech crafting system to learn more. Victorious skins are very unique and you can obtain them only as a reward for reaching a certain rank in LoL (usually it’s gold or higher). Here an elo boost can help you. So how to get free victorious skins? Just keep playing ranked games to reach gold or higher rank in competitive matches. So when the season will end, you will receive your awesome reward. Here we will list all free victorious skins which were available in the past. 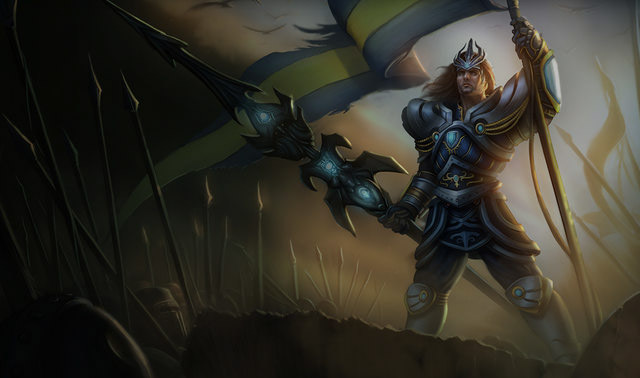 LoL Victorious Jarvan skin was the season’s 1 reward for all players that reached Gold and Platinum rank. With that skin was born the tradition to celebrate the end of each season with unique Victorious skin. 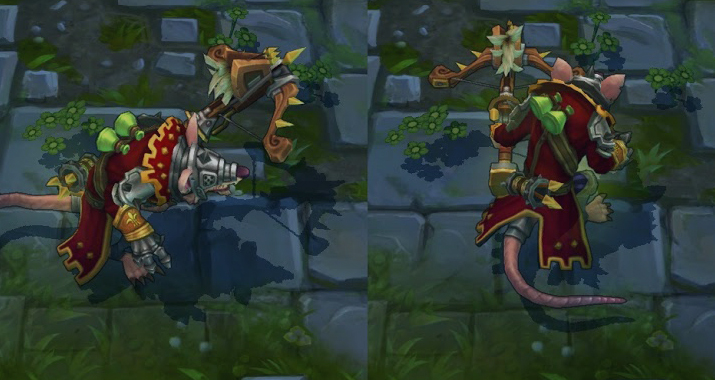 Even though this champion does not get any new animations or effects it is very desirable skin for all LoL players. LoL Victorious Janna skin was the season’s 2 reward for all players that reached Gold, Platinum, Master or Challenger rank. 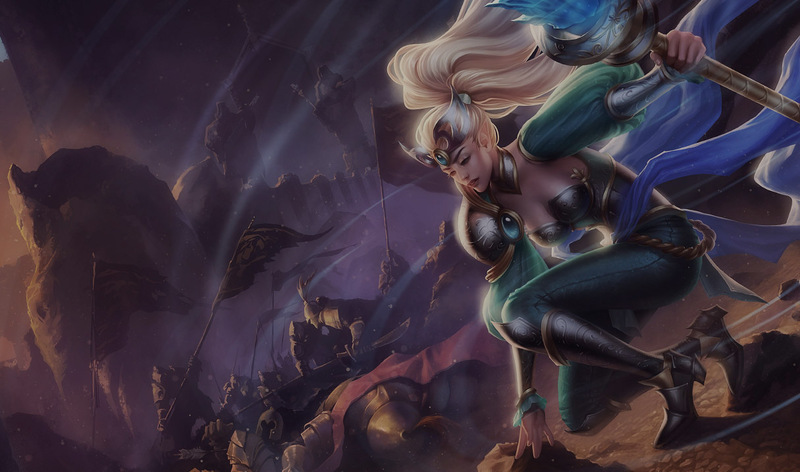 Victorious Janna free skin changes her’s standard model with a new, enhanced one, add new staff and improve her’s air elemental – Zephyr. This skin has no new animations or sound effects. LoL Victorious Elise skin was the season’s 3 reward for all players that reached Gold, Platinum or any higher rank. 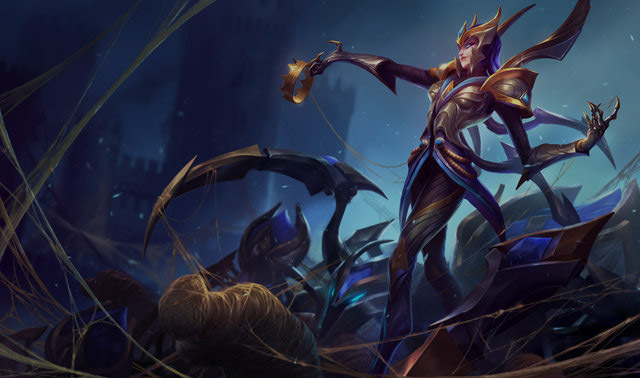 Elise with her new Victorious skin received new spider form, new particles for her abilities and auto attacks, and new recall animation in each of her’s form. 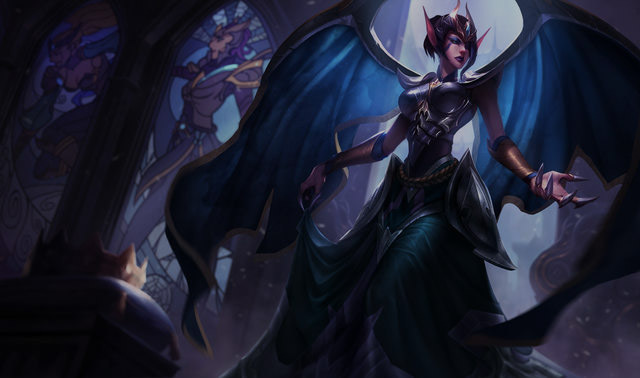 LoL Victorious Morgana skin was the season’s 4 reward for all players who reached Gold, Platinum, Master or Challenger rank. 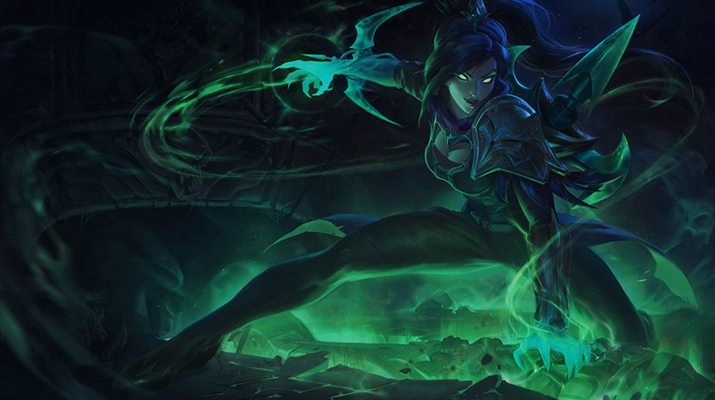 Morgana’s victorious skin has new visual dark-blue effects on the spells, new particles and black aura around her. 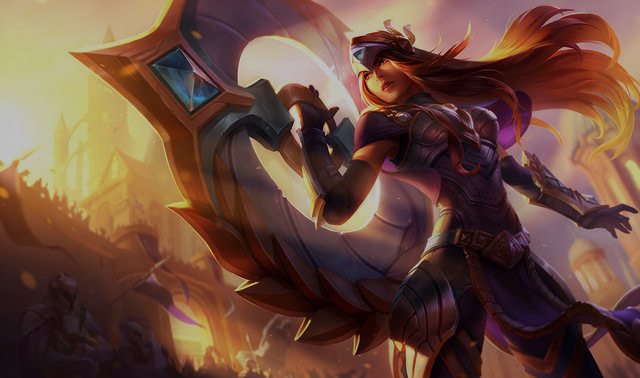 LoL Victorious Sivir skin was the season’s 5 reward for all players who reached Gold or higher rank. This skin have some new enhancements like new model, textures, particles and unique recall animation. 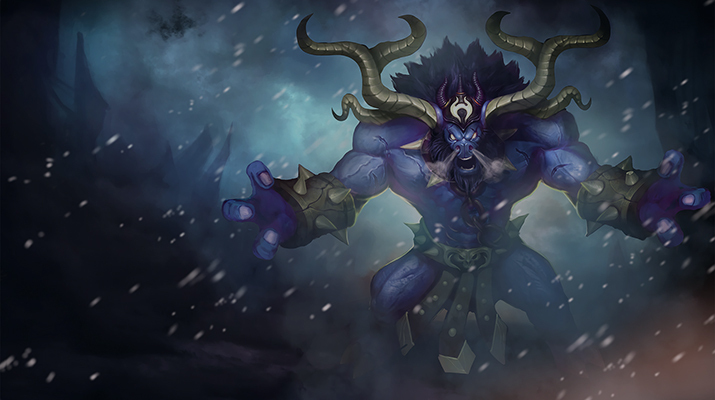 LoL Victorious Maokai skin was the season’s 6 reward for all players who reached Gold+ rank. 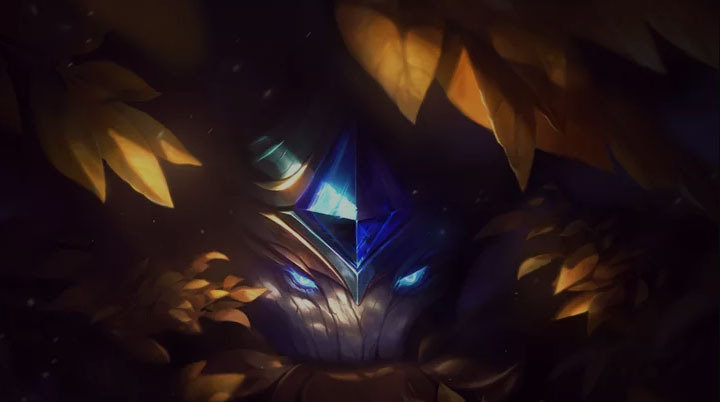 Many people’s said that Maokai does not deserve to have Victorious skin because many people think that season’s 6 reward would be Vi (because of 6 = VI). Still victorious Maokai is pretty cool. All players who have Gold, Platinum, Diamond, Master or Challenger Ranking by the end of the season will get this Victorious skin as season rewards. The first victorious skin which got chromas for success in different queues. Looks good and looks really victorious with purple cloak. Remember that all they were a Limited Edition Season Reward Skin and there is no way that you can obtain Victorious champion skin for free already! Only skins from this list you can get for free. There are some sites on the internet which offer free skins and riot points. This is obvious scam. LoL detailed guide: How armor and magic armor works? Just got my tristana skin, thank you. YOU CAN TYPE IT ON THE PURCHASE RP ICON AND GO TO REDEEM COSES AND BOOM! UNLOCKED TRISTANA AND TRISTANA SKIN! 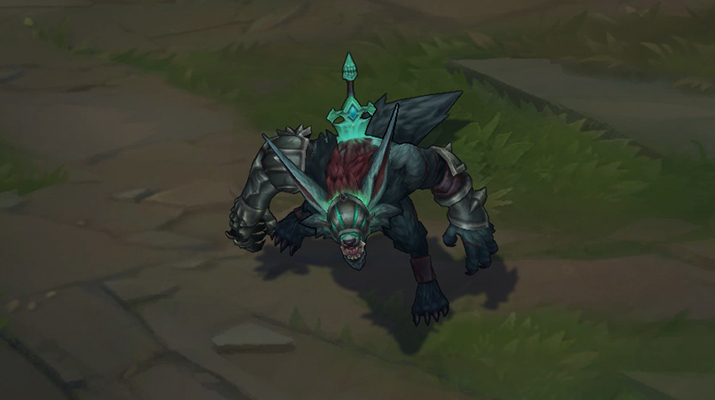 Yo how do I get a grey warwick skin? give me dunk master darius plssssss!!! give me project ashe plssss!!! give me project yi pl!!!!! give me champion azir plsss!! how did u get it? Lol says invalid code for Tristana’s skin. Has it been removed? The link for alistar skin, in my server, euw.leagueoflegends.com/youtube is off?? i can’t get tristana skin.. why? when i enter the code tell’s me that’s a problem with “fulfilling store..” something like that. Wow, didn’t even know what i can get champions for free in league! Hell! i want this Ryze skin..
HOW DO I DO IT GUYZ?? I can’t get the Alistar skin, I do everything like it has to be but with no success. I am EUNE player ( I changed the link to eune -not dumb) ;; I click sub then its error and tells me to try later. Tristana code is invalid !!! How can i get another ? I’ve got the skins! Lol…. Nice ai.! I’ve got the skins(tristana & garen)! Lol…. Nice ai.! Next I’m gonna try da alister skin……. but ww skin u can get it now look the first step u make 3 acc and when u make them u will find under the word YOUR ACCOUNT HAS BEEN CREATED and write the refer to your main acc then raise up the 3 acc to lvl 10 then go to your main acc in lol page and log in then press on your picture and u will find setting … and another things then choose refer a friend program roll down and press calim to all your 3 acc u will take 3000 ip and murwader warwick wait 1 day only then viola !! I am from the east using Garena Singapore. 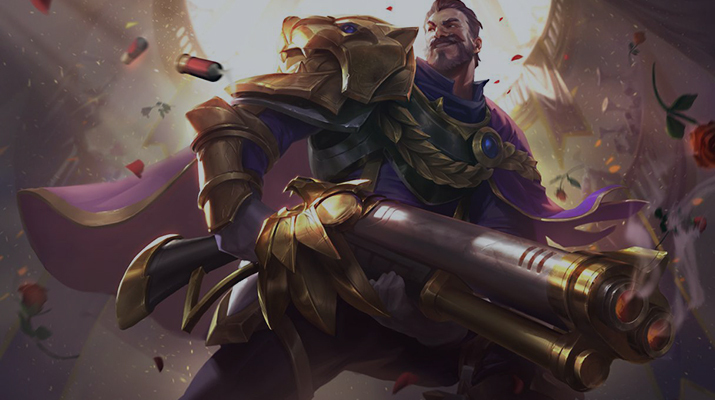 Does redemption code for Garen skin work? I from malaysia…can it work? Are there anymore free skin? Work with garen skin, bur just in second try, first one give a code that does n t work, but second time i tries, it worked…. Just remove from twiter and do it again…. Give me skin GREY WARWICK . Guys.. i really need a skin.. if u wanna find me in game, my name is xSczMamBasit .. i am a verry good support. Thank you guys..
the code for the tristana skin doesn’t work, why? The Alistar link doesn’t work for me. Any suggestions? please unlock me unchained alistar and riot girl tristana ok? i dont know get Riot Girl Tristana please riot give me that. how to get a free skin????? PLAESE GIVE ME A DIANA SKIN PLSSS..! PLEASE GIVE ME DIANA SKIN PLSSS..! May i have the project yi skin please? 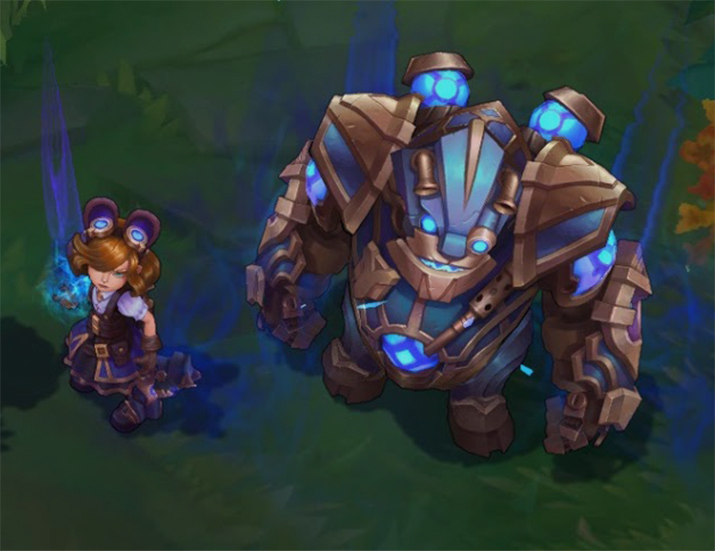 I Want a blitzcrank Skin please :'(! Hi! Uh, I lived here in the Philippines, and the Tristana skin didn’t work..
Hope you see this, the link for tristana don’t work if you click on them ( they redirect to NA ), copy paste them into your browser they will work. Btw, Unchained Alistar does not work. Alistar not working , can u give me alistar ? Alistar’s sites not working can u give me any other link ? The free skin have expiration? I like it. I have tristana and garen skin. But i dont know how to get alistar. can i have a free miss fortune champion pls? Last but not least, nationwide criminal background check canada and free criminal background check by social security number. Indeed, how to look up public court records free, federal background check speeding ticket or criminal background check illinois employment. In addition to this houston police department records division address more preferably than lexisnexis employment screening business edition. Free skins are always cool skins. It is the most incredible thing ever created by Riots for free! Especially i love the Unchained Alistar! He look even more brutal and hell, i like it! The Tristana Skin Isn’t Working For the Eune Servers. When will it be fixed?? The Garen and Tristana skins are no longer valid in the OCE, nor other servers to my knowledge – I have tried. Most are outdated and expired. You should check them to find out more.